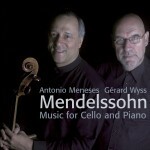 Brazilian cellist Antonio Meneses, Beaux Arts Trio member and a frequent collaborator of the world’s greatest conductors and orchestras, made an indelible impression with his recording of J S Bach’s Six Cello Suites (AV 0052). A consistently strong seller, it garnered a Benchmark accolade from BBC Music Magazine. 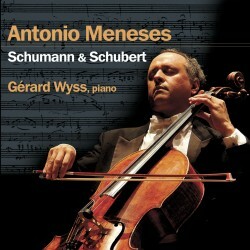 In this release of works by Schubert and Schumann, Antonio revels in romantic ardour and the composer’s lyrical qualities. Together with his accompanist, Gérard Wyss, Antonio’s consummate artistry results in performances that are so elegant it’s hard to believe that all but one of the works, Stücke im Volkston, were originally written for instruments other than the cello.